Balluff's Automation-in-Action Demo Van provided students from local colleges and universities the opportunity to learn about a wide variety of automation and manufacturing applications. The Balluff Automation-In-Action Van visits local colleges and universities. Students were inspired by what they saw and they enjoyed playing with the different sensors. 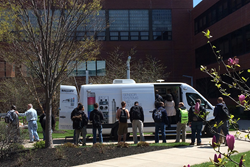 With a goal of educating engineering and technical students about manufacturing and automaton, the Balluff Automation-In-Action demo van visited seven universities and colleges in five days during the week of April 11th 2016. Balluff's demo van (@Balluffbus on twitter) is a mobile tradeshow demonstrating a wide variety of automation applications across many different technologies and industries. 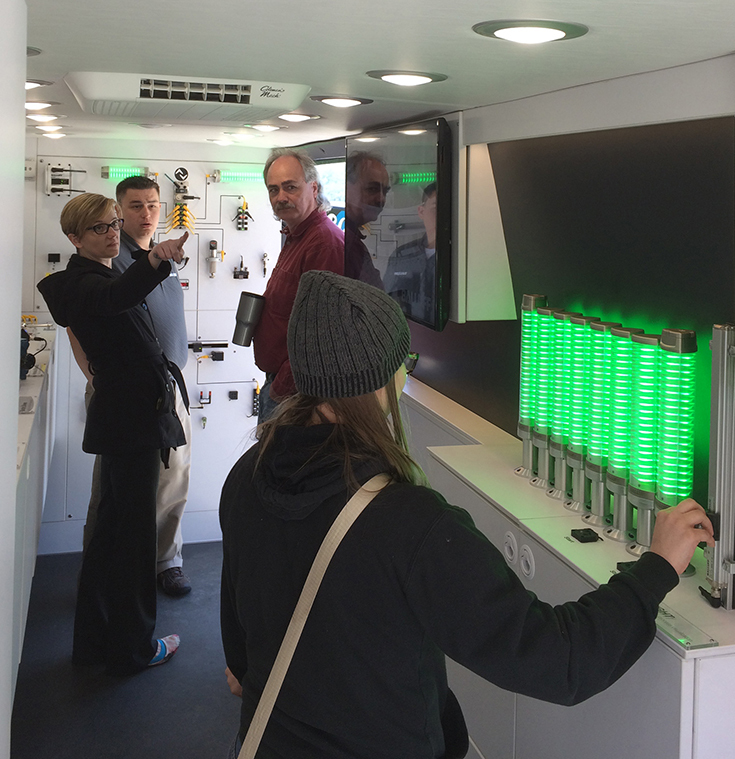 The Balluff Automation-In-Action demo van stopped for several hours at different Engineering and Technology schools in Kentucky, Ohio, and Indiana to give students the opportunity to learn about automation technologies and industries. Over 175 students from Gateway Community & Technical College, Northern Kentucky University, University of Cincinnati, Cincinnati State, University of Dayton, Central State University and Purdue University participated in this event. Students were encouraged to get hands-on with live demos, ask questions, and see how sensors, actuators, industrial networks and RFID technologies are used to make manufacturers more successful with automation. Professors and faculty were also very engaged in the visits according to Morteza Sadat-Hossieny, Ph.D., Director of Engineering Technology at Northern Kentucky University, "they have an enthusiasm to utilize the kind of sensors they saw in their teaching curricula as well as in their automated manufacturing labs." "Students were inspired by what they saw and they enjoyed playing with the different sensors," stated Janet Dong, Ph.D., Associate Professor in the School of Dynamic Systems in the College of Engineering and Applied Science at the University of Cincinnati. "Underclassman learned about sensors and their applications firsthand. For upperclassman, the demo van gave the opportunity for them to compare what they know of other company's products to Balluff's products, which opens the door for students to use sensors at a company in their backyard, for their future projects." Recent college graduate Joshua Rodgers, Technical Sales Trainee at Balluff Inc., provided tours to students during the Automation-In-Action college week. "Usually, this vehicle is displayed to engineers in the industry that have extensive experience in the automation world," stated Rodgers, who also takes the demo van to factory sites. "During these college tours, I was furthering my own understanding of the automation industry by adjusting my explanations of our technologies to fit a college student's experience. It was evident in the excitement we received that we sparked interest in the manufacturing industry." "We strongly believe in the importance of supporting STEM (Science, Technology, Engineering and Math) programs and activities; especially those that encourage students to enter manufacturing and automation careers," says Will Healy III, Strategic Marketing Manager at Balluff in Florence, KY. "Events like a visit from our demo van can be the spark that creates an interest and a passion for automation and manufacturing with STEM students." Balluff supports several STEM initiatives for students in the local community, provides career opportunity tours for high schools, participates in MFGDAY events each year and participates in TECHFIT (Teaching Engineering Concepts to Harness Future Innovators and Technologists) programs at Purdue University and The College of Charleston. Balluff also supports educational opportunities with their student co-op programs, partnering with several local colleges and universities. See photos from Balluff's College Tour on Flickr. Manufacturing Institute Study: "The skills gap in U.S. manufacturing 2015 and beyond"